Reading Wednesday! On an actual Wednesday! Because I haven't been posting enough about books lately. Books! The last thing I finished was Ghost Circles, volume #7 of Jeff Smith's Bone fantasy graphic novel series. I actually read it a few months ago, but I somehow had succeeded in skipping volume #6. So I went back and read that, and thought I'd reread #7 in its proper place before going on to #8. It's so gorgeous and amazing it can do with many rereads, anyway. Other things I've read recently: The last novel I finished was Half-Off Ragnarok by Seanan McGuire (Book #3 of InCryptid - enjoyed it a lot, though I maybe enjoyed the two previous ones a bit more). In the non-fiction front, I recently finished Genius of Birds by Jennifer Ackerman, which is a popular science book about the intelligence of birds. It was very interesting, though the style was typical of modern American pop science books (but at least it wasn't about the writer's personal journey of discovery!). But birds are awesome. I read it in Finnish, and it was rather interesting sometimes because she'd often refer to American birds which are totally unknown here though probably common enough in North America. The translator had somehow dug up the names for all of them, some of which were quite complicated in Finnish because the birds aren't native here so some biologists have just put together a name, I guess. I've also recently read Alice Payne Arrives by Kate Heartfield, and Creatures of Will and Temper by Molly Tanzer, both of which were fabulous and both of which I should write little reviews of for fffriday. Also, surprisingly many Finnish things, from a 1930s detective story to a lovely lesbian YA graphic novel. As always, I've got ever so many books that I really want to read as soon as I get some of the current ones finished. More history, many Hugo nominees, some Finnish historical novels I'd like to get to eventually, and several comic books / graphic novels that I inadvertently picked up the other day in the library. I swear it was an accident, I meant to look at the LGBTQ+ shelf, but it was occupied so I had to go somewhere else for a while, and the next thing I knew, I had all these graphic novels in my hands. Also, I've got several Hugo (and not-a-Hugo) nominees waiting for me, as my library reservations on them have been going through. I think when I'm finished with The Belles, I'll go for Naomi Novik's Spinning Silver or one of the series category starters, depending on which one the library wants back the soonest. But we'll see! My reading plans rarely are very solid, and I'm a creature of whims and moods when it comes to reading books. Have any of you been reading anything interesting you'd like to share? Not only is it a cool piece of Doctor Who crossover art that features a giant steampunk octopus coming out of the TARDIS - but why didn't I know before there exists something that features a chipper greenhaired steampunk lady and her pet/friend octopus, going about and doing things, as you do? If you didn't know either, and want to know, see here? It's entirely adorable. I might need those books. It's occurred to me that I haven't shared here the last few fics I wrote, for Fandom Stocking (which was in January!) and Chocolate Box (which also has been a while, namely two months!). Actually, this has occurred to me fairly often, but not when I've been sitting down at the computer with leisure to write. As I didn't gush about my Chocolate Box gift at all here, I'm doing so at the end of the post, so check that out if you want to be recced some lovely Jane Austen femslash! For Fandom Stocking, I wrote two little ficlets (I need to get my browser to stop correcting that word to fillets!) for thisbluespirit. The first was a little piece of silliness involving Two, Jamie and Zoe and historical clothing. Because 18th century aristocratic fashion will never stop being amusing. Summary: When you time-travel to other eras, you have to dress the part. The other fic also for thisbluespirit was a little Bill/Ace story. My first time writing Ace. It was lots of fun! Summary: Ace and Bill, on a date, at a rocket launch. Also, slightly late but not too much later than deadline, I managed to post a Thirteen/Missy fic for trobadora. I'd written two Thirteen/Missy stories before we had more than a couple of minutes of Thirteen canon, so I wanted to give it a go now that we've actually had a season with her. Contains biscuits! Summary: The Doctor brings Missy in to admire her new TARDIS, but biscuits aren't the only thing Missy wants a taste of. As I briefly gushed after the reveals, my own stocking was delightfully stuffed with fics, icons, recs, recipes and art, both from friends and strangers, and it would take far too long to list all of them separately. But I'll direct you to the Fandom Stocking 2018 collection if you haven't got around to checking it out in the past months, as many lovely things were created for the fest. In February, for Chocolate Box, the "good things to eat" theme inadvertently continued in gen form as I wrote a Bill & Twelve fic. It's not all about pancakes, but there are pancakes, too. It could be called my first attempt at a five things fic if it had five parts, but it has four. Summary: Moments from the life of Bill and the Doctor on the TARDIS, in four scenes. And, because I haven't gushed about Chocolate Box at all, I should add that my own gift that was written for me was a delightful Fanny Price/Mary Crawford fic for Jane Austen's Mansfield Park. Go enjoy some historical f/f / Jane Austen femslash! Summary: Fanny began going more and more often to the Parsonage. People, tag your fandoms right. A regular pet peeve: why do people write New Who fic with only New Who characters etc. tagged on AO3, with no sign in the summary or the tags that there are in fact any Classic Who elements present, and then tag it both with Doctor Who (2005) and Doctor Who (1963) (ie. Classic Who)? There's a reason those fandom tags are separate on the archive. If it's truly a crossover fic for both the new and classic series, by all means tag it with both. But trust me, when I'm looking in the Classic Who fandom tag, it's not because I want to read Ten/Rose or Twelve/Clara. It's really, really NOT. It's pretty ridiculous that Ten/Rose is actually in the top ten relationship tags for Classic Who. Some of them might be legitimately there, for some crossover reasons, but based on the samples I've seen when I'm just trying to find new Classic Who content, the majority is most likely not. I know I can filter tags to exclude things I don't want, but I shouldn't have to start my browsing by filtering out stuff that belong in the fandom tag in the first place. Maybe I'll soon start leaving peeved comments in those fics, except that a) I don't want to increase their hit and comment count, and b) the sort of people who tag in the wrong fandoms probably aren't people I want to get into an argument with. So I'll just continue fuming on my own. This is where I like the way Teaspoon is organized by era. People don't tend to stick random Twelve/Clara into the Second Doctor or Fifth Doctor categories unless it's really and truly a crossover. A bit of this and that involving stuff currently going on in Dreamwidth communities, fic exchanges/fests etc. Mostly me promoting and linking to things! 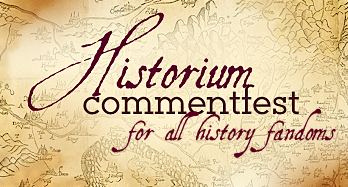 historium has a commentfest! Go there to leave prompts for historical fandoms (I need something I can write for!!!) or pick up prompts and write something. thisbluespirit also has started posting a semi-regular newsletter to the community, so all the more reason to subscribe/join or at least check it out periodically if you're into fandoms that count as historical (historical fiction, historical fantasy/SF/alt-history, fiction that used to be contemporary but is now historical, such as Jane Austen or a billion other things; or historical RPF). Also, the fest has quite a few pinch hits already - I assume it mostly means requests that couldn't be assigned during the match-up - so if you didn't sign up but feel like you'd like to write some hurt/comfort fic for someone anyway, or if you did sign up but feel you could do more than just one, head over to this post and check out the current pinch hits. who_guestfest, the Doctor Who minor characters ficathon, has sign-ups open now. I'm trying to decide what to sign up for, and get my brain to form some prompts, but basically I've been super much looking forward to this ever since I started watching Classic Who and suddenly had a ton of guest characters I wanted to know more about. I mean, New Who and spin-offs apply just as well, it's just that somehow I've gotten more interested in the minor characters of Classic Who - most likely because the serial format means there was more time to develop the minor characters. ETA: Knew I'd forget something! Just your periodical reminder that tardis_library is a lovely Whovian fandoms all-mediums reccing community, with themed challenges to prompt the reccing, but also you can rec pretty much anything you like any time as long as you follow the rules and guidelines of the community. The current monthly theme is Seventh Doctor era or romance, and the newly opened seasonal challenge is creating a manifesto. I'm still trying to decide which theme to claim for myself, but I'm definitely going to sign up once I've decided. I've felt like writing fluff would do me good, so hopefully this'll be fun! The sign-ups are open in the community now if you want a bingo card of your own. For once I'm remembering to write a bit of a book review for fffriday, partly helped by the fact that I did just finish this book today! This is a short, stand-alone fantasy novel which I saw recommended as a queer retelling of the Beauty and the Beast. Broadly speaking that's true, but it's not just a straight retelling of any version I know, but takes the main themes and weaves a story entirely of its own, of a young woman forced to live in the palace of a female dragon, and finding herself drawn towards her. The culture draws much from Asian culture and mythology - I frankly don't know enough about Asian cultures to comment on it except that it would appear to specifically based on Vietnamese culture, which is the author's background as well. I love the presence of all these to me unusual and different cultural elements and the way they're carefully woven to the story and its mythology. I don't have the right words to describe this book, but I loved it. Very much. I love Yên, the heroine, and Vu Côn, the female dragon, and all the other characters in the story. I love the development of the relationship between Yên and Vu Côn, the intricate descriptions of feelings and touches. The scenes are delicately sensual. I love the way the dragon has different forms, a more human-like form but yet not entirely human, and a fully dragon form, more like what we think of when we think of dragons, at least Eastern ones (and I should add that this is definitely a water dragon). I love the fact that the romantic and sensual scenes don't shy away from this non-humanness, and that it's a part of what Yên loves. This might be a bit too much for some readers, though. The Beauty and the Beast themes that the story treats are the ones of seeing past appearances and learning to love people who are different, the acceptance of outcasts, the power of our choices in deciding who we are; rather than the "a good woman's love transforms a bad person" trope. I particularly love that they aren't only about Vu Côn the dragon; there are others whose otherness and possible danger Yên also needs to face, and who need to learn to choose who they want to be. Also noting that the cultures in the book have gender roles beyond the binary; there are non-binary characters who are referred to with gender-neutral terms, and Yên figures out each person's gender from the words they use to refer to themselves, not from their appearance. The novel is short, 129-160 pages depending on the edition, but it feels like it has everything it needs, though I would be happy to return to this world in another story. From what I've read of Aliette de Bodard, she excels at writing much in comparatively few words, and this is the finest I've read of her so far. A strong recommend for anyone who, from the description, thinks it might be their cup of tea. Finally, since this book came out in 2018, it's eligible for the Hugos in the novel category, so if you're still looking for something to nominate, this isn't a long read. As for me, I'm definitely nominating it. Thank you so much for writing for me! I’m a total sucker for hurt/comfort fics, so when I learned there’s an exchange specifically for them, I had to sign up. Now, I picked enough freeform tags that they should already give you plenty of prompts and ideas, and if you go from one or more of them and avoid my DNWs, you should be very well off. But here’s more information and some fandom-specific prompts in case it’s useful for you! I apologise this is very long and rambling, especially with all the freeform tags from the sign-up included. Don’t be put off by it or think I’m especially demanding. It was taking so much time to just get any thoughts into words that I didn’t manage to make it concise as well! If anything feels like too much pressure, just ignore it. You can always just go along with the relationships and something from the freeform tags; this letter is just to provide extra information and specific prompts if you feel you need them, espeically since in all fandoms I’ve selected several possible relationships. I'm too tired to post any sensible fannish content now (mind you, I feel there's something off with the expression of 'sensible fannish content' - like those words don't belong together, you know). But I just wanted to say that, after life things and such have conspired to slow down my much-loved Second Doctor era watching, I finally finished my rewatch of The Invasion, and that story just makes me so happy. It's even better than I remembered! And Zoe gets to be so awesome in it. Go, brilliant scientist girl saving (some of) the day! In a story made in 1968! Definitely a Classic Who/Second Doctor story I much recommend! Though probably not as the first introduction to either, simply because it's 8 episodes long and two of the episodes are animated because the original episodes are missing and only their soundtracks survive. But when you've watched some other Second Doctor era, this one should definitely be on your list as well. It's got an interesting plot, an awesome bad guy played by an excellent actor, a great supporting cast (Isobel! and that Brigadier chap is rather important for the series as a whole, you know, and this organization named UNIT also makes its first appearance). The TARDIS trio of the Doctor, Jamie and Zoe are in great form, and it's a story where all three get to be very much themselves and get enjoyable stuff to do and I just love these actors and I could go on and on and on about this but I probably need to start getting ready for bed. 2: Reading Wednesday! On an actual Wednesday!